I realize I haven’t posted a dessert recipe in about a week now. I don’t know why, I just felt like there was a big call for savory lately. I took that into consideration and stashed away my sugar for six days, but I’m sorry because I can’t hold out any longer. My soul needed a dessert…and yours does, too. 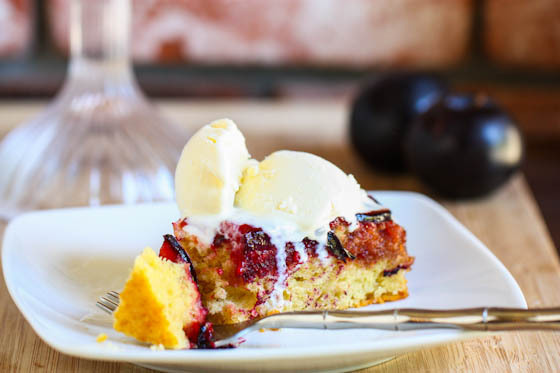 Plums are taking over the produce section everywhere right now, and this brown butter plum upside down cake is the most delicious way I know to make good use of them. There’s only so much plum jam you can make, people. Sometimes you just need to bake a cake. And this cake is especially gorgeous and tasty! I love upside down cakes. They’re just so fun because the look like a plain ol’ cake in the oven and then when you flip them over—-tah-dah!!!!!! I really think that if people knew just how easy upside down cakes were to make, there would be a lot more of them going around. I was going to say something profound here on the merits of brown butter. But then I realized there’s nothing I can say here now that I haven’t said a zillion times over the past five years of blogging. So, you know. You know. Just do it. And then stick some ice cream on it!! Slice the plums 1/4″ thick using a sharp knife. This will be easier if the plums are ripe, but not so super juicy that they don’t slice easily. Look for ones that are still a bit firm to the touch. After you slice your plums, set slices aside. In a cast iron skillet, heat four tablespoons of the butter (1/2 stick). Melt butter and then continue to brown butter (head over here for a browning butter photo tutorial). Once butter has browned, immediately add the brown sugar and stir. Cook sugar and butter, stirring constantly, for three minutes. Pour mixture into a greased 9″ cake pan, spreading all over the bottom of the pan using a rubber spatula. Arrange the plum slices on top of the brown sugar/butter mixture in the cake pan. You should be able to get three circles of plum slices out of this, overlapping if necessary. Set aside. Cream together the remaining stick of butter with the granulated sugar until fluffy. Add the eggs, one by one, beating constantly. Then, add the vanilla. 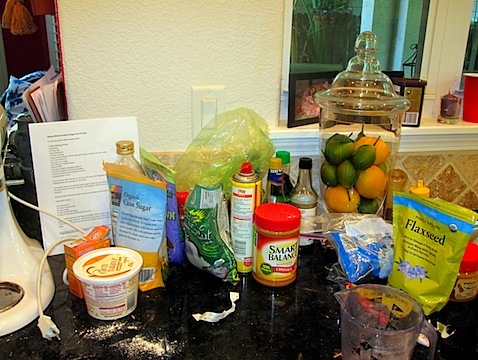 In another bowl, whisk together the flour, baking powder, salt and cinnamon. Add these dry ingredients alternately with the milk and continue beating until light and fluffy. Spread cake batter right on top of the plums. Bake for 40-45 minutes until golden brown. Let cool three minutes before saying a quick prayer and flipping cake pan over onto a large plate. Serve cake with vanilla ice cream! I think brown butter makes everything better. This cake is beautiful, Jenna!! I agree! Brown butter DOES make everything better! ooo yumm, this looks beautiful!! What’s most amazing about the cake is that it just LOOKS beautiful. I can only imagine how good it tastes! I think Jess @ How Sweet It Is would be very happy to hear your ‘just do it’ attitude towards brown butter! I’ve never actually made an upside down cake myself, but pineapple is the first one that comes to mind. 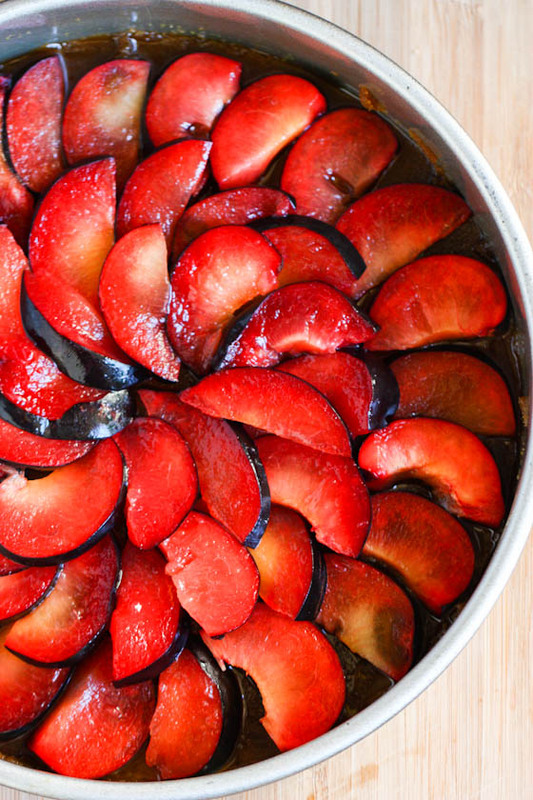 Love the idea of using plums! I don’t bake nearly often enough with plums! Actually, I’ve never baked with plums 🙂 Looks great! That’s the prettiest plum I’ve ever seen! YUM! ugh! I die for pineapple upside down cake, believe it or not Panera makes a mean one! But this sounds fantastic as well! This looks so good! I can just imagine how great this would taste with ice cream and a cup of coffee! Lovely! I can’t wait to make this. 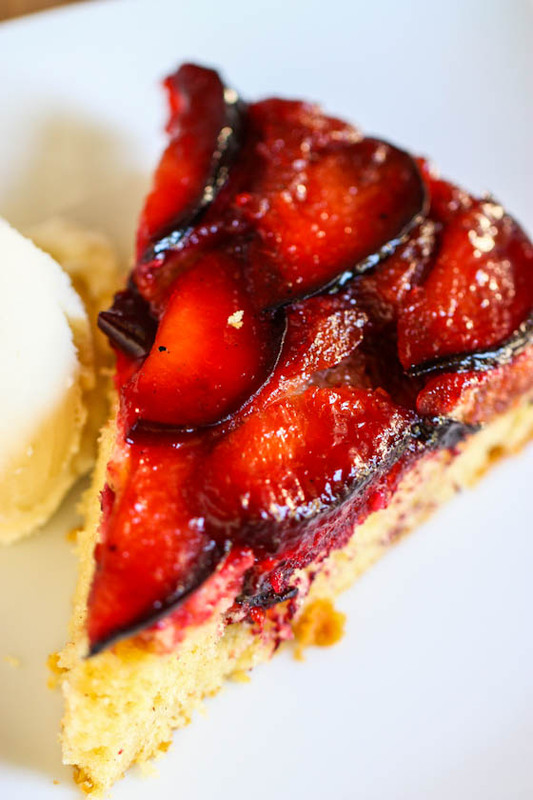 I’ve done pineapple upside down cake before but never with plums – what a creative idea! This looks phenomenal, and that ice cream puts it over the top! Beautiful photos! I just started getting into plums this year and am looking for another excuse to bake something with them. The brown butter takes it to another level! Oooh. I have a special place in my heart for plum cakes. Brown butter too! I’m sitting here in my cubicle on my lunch break drooling all your Babaganoush Soup as I read this post. Yum! I think you should have me over for dessert! Has anyone ever had you over for dinner and used one of your recipes? That would be funny. Would peaches work here, or are they too juicy? I went a little crazy at the farmers market the other day and need to use a few up before they turn to mush. This looks deeeelicous! Yum! I always find baking with plums to be a bit “sticky” 🙂 but this recipe looks so great it might be worth a try! Jenna this cake is just oozing with plum loveliness! Mmmm, it looks so good and I love upside down cakes and need to make them more often. This cake is stunning!! I want to make one for my parents! Ooh I love plums! What a great idea. Gorgeous cake!! I absolutely love plums. When you get a really good, ripe one … nothing is better! This looks SO good! I can’t wait to grab some plums and give it a try! Mmm….yes, today was a good day for a dessert post! I’ve been craving ice cream all through work and love the big scoop plunked on top of this beautiful upside down cake. Delightful! I just made a plum cake too! Will be trying yours next! Perfect timing! We just picked a boat load of plums today from a local orchard! Look at that gorgeous color! Oh, summer perfection! Don’t love to bake, but this is beautiful enough to make me think about it! I love how easy this is! And pretty! Confession: I lived on “Plum Street” for 21 years and have eaten maybe 1 plum during my entire life. I feel somewhat like a fraud for it. I need this recipe in my life. I adore upside down cake…so beautiful and so delicious! I usually go with pineapple, but this plum version is just gorgeous! OMG!!! Jenna- I made this cake last night and it is AMAZING!! I actually had exactly 2 plums in my house that I planned to eat with lunch but said what the heck and made a late-night decision to bake! 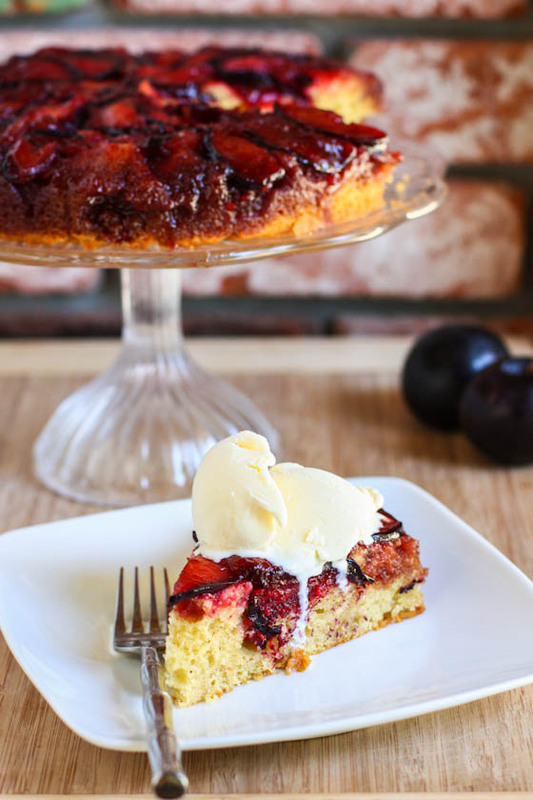 This cake turned out super moist, full of flavor and delectably sweet with the plums! Thank you so much for this great recipe! Good gosh! I have some plums in the fridge that were destined for baby food and jam, but now … maybe not. Gorgeous! Wow. I just put this cake into the oven and the batter alone is spectacular, cannot wait to taste it later. Looks divine. You always take the most beautiful photos. I read your blog every morning and look forward to it. Thank you for inspiring me! Looks great! Are there going to be any more of great grandma’s recipes coming up? I feel like it’s been a while since the last one! This looks so tasty, Jenna! And Fresh! I’m going to try it out next time I’m making dessert..woo! I made this cake tonight for a gathering. We all loved it! Even the kids were asking for more plum cake! This looks great, do you think it could be made with fresh figs? My neighbor has a fig tree that I have free reign over and there are a ton!! Thanks! This recipe is very, very close to one I’ve been making since high school(which, let me assure you, was some time ago). In fact, I’ll be making several for my sister’s wedding this fall. But, I’ve never browned the butter, so I can see that I have some test baking to do before then. Thanks for sharing. I never made a cake with plums but my mom just simply loves plums so I am going to make this cake for her. Thanks for sharing. That looks yummy and tempting too. Must be rich in calories as well, mind telling me some alternative for the sake of calorie conscious people. I have made many pineapple upside down cakes in my iron skillet. Can I just put the plums on top of the browned butter and sugar mixture then add the batter and bake in the skillet as I do the pineapple recipe? Beth, mine (in a cast iron skillet) came out of the oven minutes ago… it’s amazing! I baked it for 40 minutes and it came out perfectly. Funny we both want to try this 2 years after she published the recipe. Did you make it? It’s a keeper!